Congratulations to @mhuinker for being our Top Poster of the Month! Keep up the great work! Note: Staff Members can only receive this award once per calendar year. 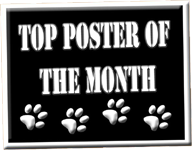 The challenge is on, can you be our next Top Poster of the Month? Congratulations, Michelle! Keep up the good work!!! look at you.... new puppy and an award all in the same month!! Congrats to you Michelle, good job. Now you have your Frenchie you will have more to talk about. Thanks everyone!! Leo and I look forward to being long standing members on this wonderful forum! And who knows, maybe one day little Leo will have a sister or brother to play with. Whites of eyes going brown?